Mystery Mars Cloud: An Auroral Umbrella? The strange cloud-like protursion above Mars' limb (around the 1 o'clock point). Credit: Wayne Jaeschke. 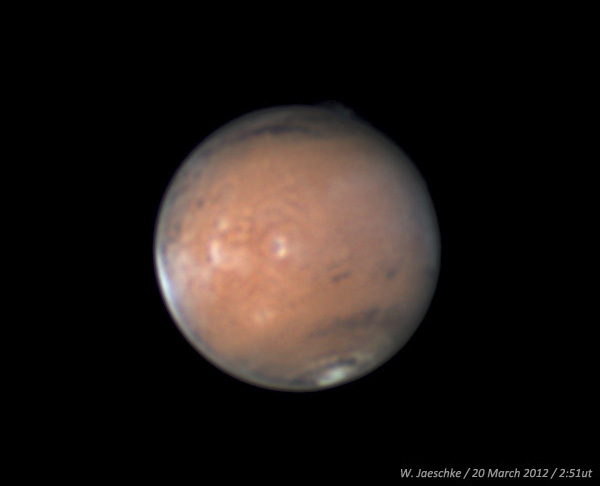 Last week, amateur astronomer Wayne Jaeschke noticed something peculiar in his observations of Mars — there appeared to be a cloud-like structure hanging above the limb of the planet. Many theories have been put forward as to what the phenomenon could be — high altitude cloud? Dust storm? An asteroid impact plume?! — but it’s all conjecture until we can get follow-up observations. It is hoped that NASA’s Mars Odyssey satellite might be able to slew around and get a close-up view. However, it appears to be a transient event that is decreasing in size, so follow-up observations may not be possible. For the moment, it’s looking very likely that it is some kind of short-lived atmospheric feature, and if I had to put money on it, I’d probably edge more toward the mundane — like a high-altitude cloud formation. But there is one other possibility that immediately came to mind when I saw Jaeschke’s photograph: Could it be the effect of a magnetic umbrella? Despite the lack of a global magnetic field like Earth’s magnetosphere, Mars does have small pockets of magnetism over its surface. 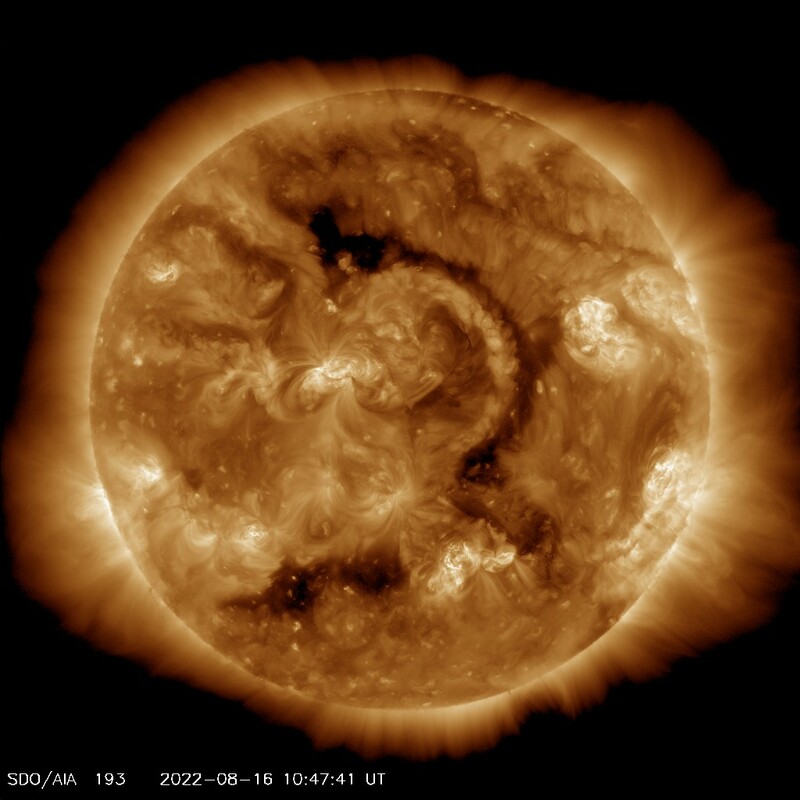 When solar wind particles collide with the Earth’s magnetosphere, highly energetic particles are channeled to the poles and impact the high altitude atmosphere — aurorae are the result. On Mars, however, it’s different. Though the planet may not experience the intense “auroral oval” like its terrestrial counterpart, when the conditions are right, solar particles my hit these small pockets of magnetism. The result? Auroral umbrellas. The physics is fairly straight forward — the discreet magnetic pockets act as bubbles, directing the charged solar particles around them in an umbrella fashion. 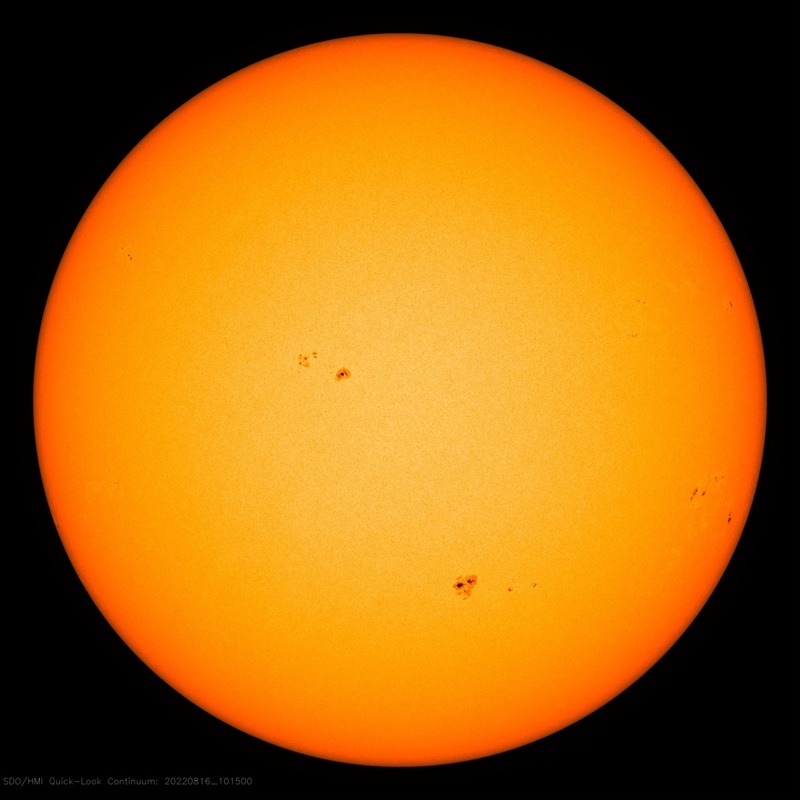 There is limited observational evidence for these space weather features, but they should be possible. As the sun is going through a period of unrest, amplifying the ferocity of solar storms, popping off coronal mass ejections (CMEs) and solar flares, could the cloud-like feature seen in Jaeschke’s photograph be a bright auroral umbrella? I’m additionally curious as a magnetic feature like this would be rooted in the planet’s crust and would move with the rotation of the planet. It would also be a transient event — much like an atmospheric phenomenon. The physics may sound plausible, but it would be interesting to see what amateur astronomers think. Could such a feature appear in Mars observations? For more information, see Jaeschke’s ExoSky website. 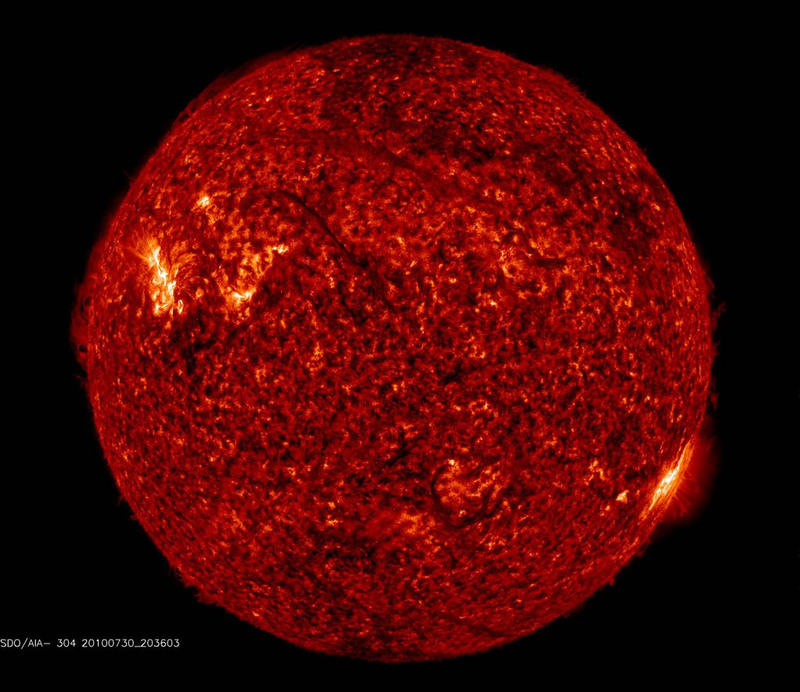 Author Ian O'NeillPosted on March 26, 2012 Categories Astronomy, Featured Articles, Mars, Solar Physics, Space WeatherTags Mars, mystery, Space WeatherLeave a comment on Mystery Mars Cloud: An Auroral Umbrella? Not only does Saturn have a mysterious hexagonal shape etched into the bands of cloud above its north pole, it also has a unique magnetic structure. This is suggested by recent results recorded by the NASA Cassini probe that passed over the pole to see a huge active auroral region, much larger and more dynamic than expected. Interestingly, the NASA press release has not linked the strange aurora with the long-lived hexagonal shape in the gas giant’s atmosphere. Could the hexagon be formed by a unique magnetic structure above Saturn? Or could both phenomena be connected in some other way?